Contract Logix Express Product Brochure. 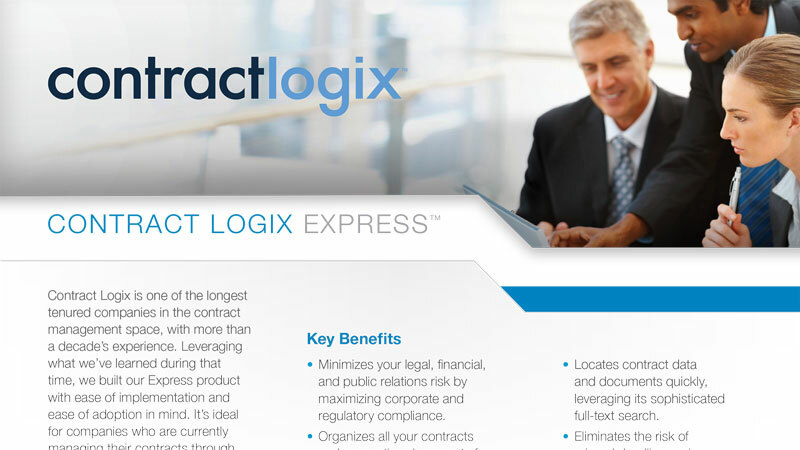 This 2-page brochure provides a brief overview on the Contract Logix Express contract management software. It highlights the features and benefits the product delivers in centralizing your contracts and supporting documents into a secure electronic repository; enabling you to create alerts, reminders, and tasks to keep track of your most critical terms and dates; and empowering you with reports, dashboards and search capabilities. And you can learn how to onboard the solution in just 1 hour! Streamline your contract management process. Never miss a contract deadline or date – reduce your risk. Run reports, create dashboards, and easily locate important information.